LinkedIn is a great place for businesses to attract new customers. If you sell to other businesses and business professionals, LinkedIn is the place to be in social media. At GBW, we use LinkedIn to create a company page and provide our blog updates there so we can grow our audience and hopefully continue to grow our business as a result of the branding efforts. I’ve said before here on the blog that we’ve gotten new clients directly through LinkedIn and I’m sure others have found us first through LinkedIn or by discovering a link to one of our posts on LinkedIn. A good LinkedIn strategy starts with your personal profile, but from there you can create a company page. 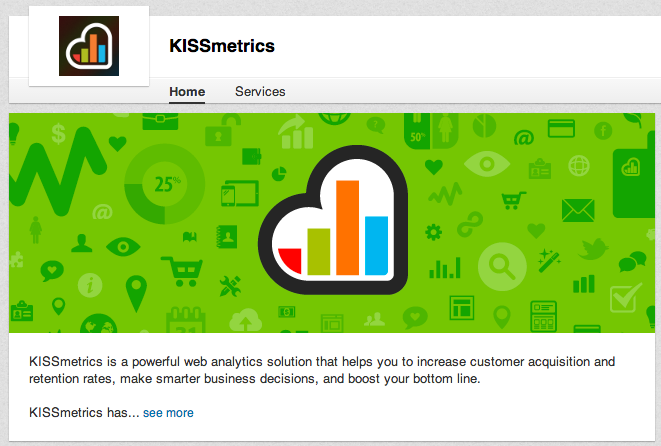 Here are a few LinkedIn company pages for your inspiration. You’re kind of limited on the design of your LinkedIn company page, but that doesn’t mean you have to do the same old same. 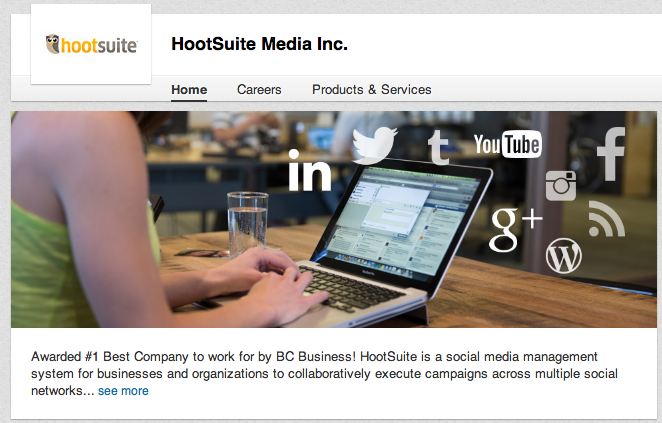 I like what HootSuite did with their main image. You can see someone (probably their target customer) working with the software on the computer and little logos of all the social media that HootSuite can manager are highlighted over the image. It’s subtle, but effective and it gets the brand message across. It sells the visitor on what the company does all in one image. 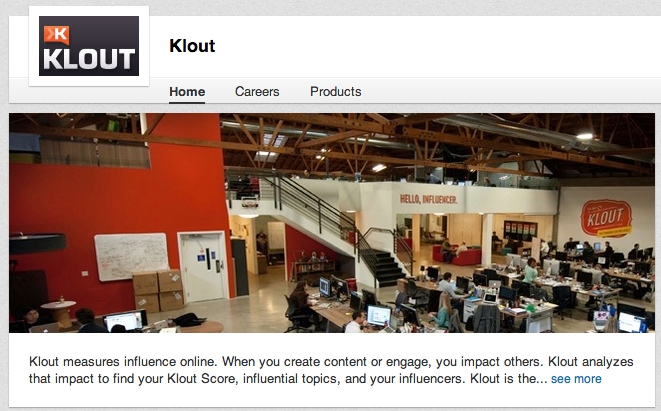 It can be difficult to keep your various social media sites updated, but Klout does a pretty good job. They share updates from their blog. It’s a great way to use something like The Snippet Strategy to update your social media profiles. 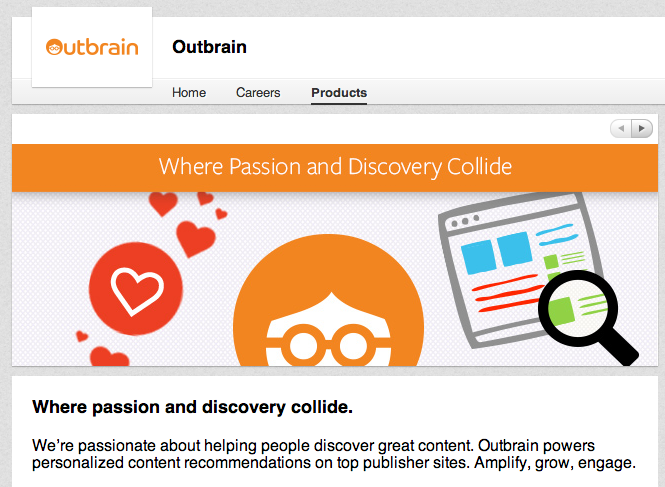 Again, Outbrain does a great job with their main LinkedIn company page image. Many of the companies on this list have great opening images. It’s so important for a good page that gets visitors interested in what you offer. Outbrain also has a really great Products page, which is the page where you can list your products. They use images well and do a good job describing the benefits of their service to target customers. Broken record – great main image. 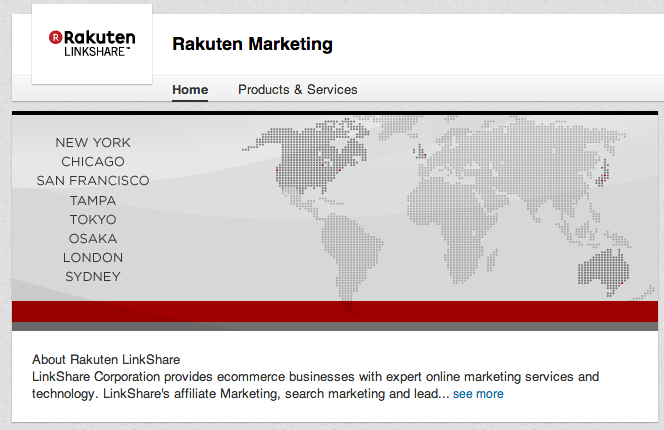 Again, pay a designer to create an image for your LinkedIn company page. It’s worth the couple hundred bucks to get a good one. When you make a good first impression and effectively communicate what you do you’ll win new clients. You’ll also see consistent updates in the feed. That shows that this brand is active. They’re not dead. And they have a good company description that defines the benefits of the service. These guys are big time in the marketing world and they have a LinkedIn page to match their reputation. That’s another thing about social media. If you’re going to have a page it’s good to have a page that holds up your reputation. 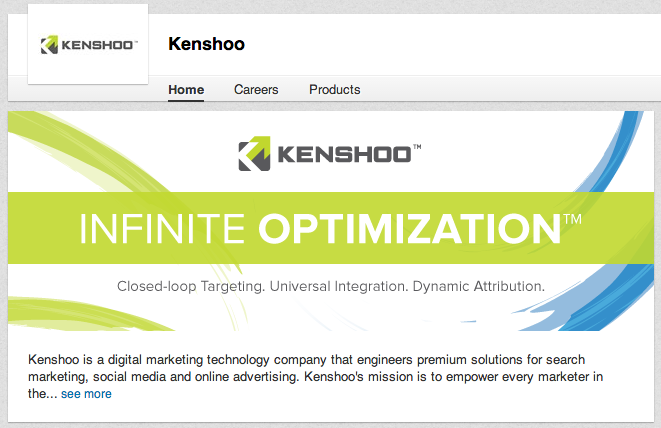 If you’re doing online marketing you should probably have a solid LinkedIn page. 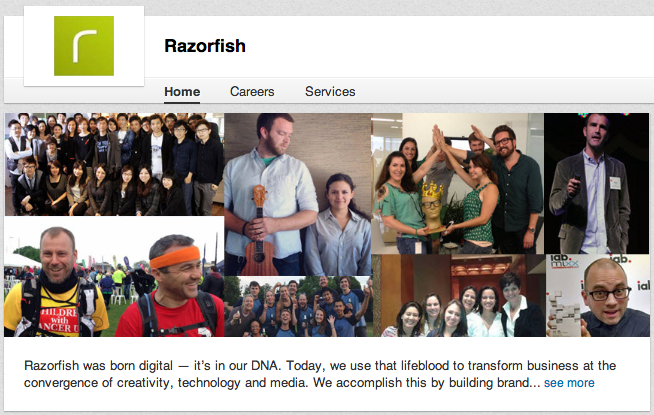 Razorfish also does a great job with the Careers area of their page. LinkedIn is for selling, but it’s also for finding great people to work with you. 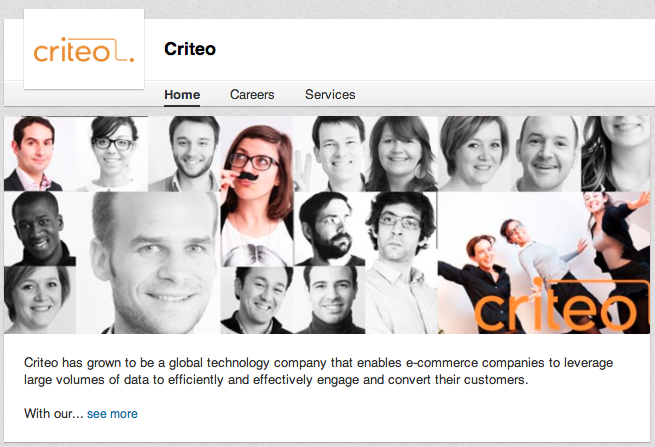 Criteo has grown as a company in the last few years so they have a solid reputation. They hold up that reputation well on LinkedIn. One thing you’ll notice on the right is the number of employees. When you launch your company page make sure you get your employees to make the connection. This provides a better representation of who you are to potential clients and partners. The page design images are simple and so is the style, but that works well in this case. Simple is good. I like simple and so do a lot of other people in the business world. The image is good. The descriptions are good and the feed is updated. Very cool image. You get one bold headline and secondary headings that let you know what the company provides. The updates are frequent. They have video on their Careers tab. And their product tabs are very well done and descriptive. 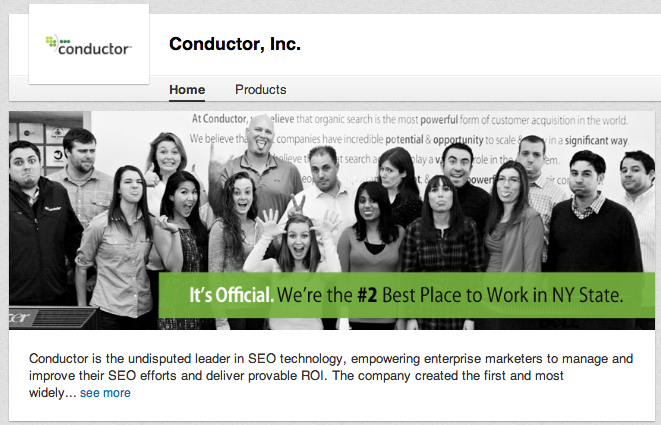 All the things mentioned above are here on the Conductor page along with a nice little mention in the image that Conductor is a great place to work. And it’s not just a claim because the source is right there as well. That’s strong branding for both potential clients and employees. 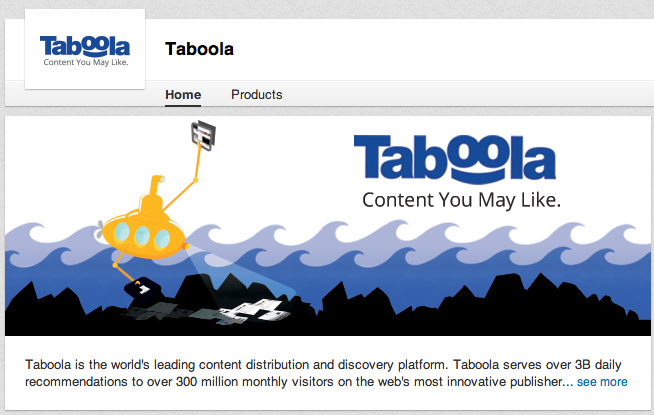 These guys are rockstars in the online world. People love their blog and their software. I’m sure a lot of people also follow them on LinkedIn. These are just a few of the great LinkedIn company pages out there. Take some inspiration from what they have done and experiment with a few things of your own. Get your page setup and start sharing your updates there. It’s a great way to grow your online audience and your business.